Every girl needs just one more pair of cute boots in her closet! 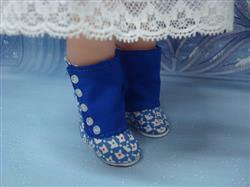 These sweet button up boots will be just what your doll has been looking for! Pair them with leggings or a cute mini skirt for the perfect outfit! Love these. Made up really cute. I bought the pattern to pair with the Carrie dress from Thimbles and Acorns---button up boots in a kind of old style. I followed the directions closely and the finished product was cute, but just a little big for my doll and a little bulky around the ankle for the period look I wanted. This will be easily adjusted for the next pair! This is a well made pattern. It was easy to use with a picture for every step and clear instructions. I enjoyed making these little boots. I love how each pair of boots can look so different depending on your material. Easy to sew, good instructions and photos. A good addition to your girls wardrobe.